Sgraffito or sgraffio and "taglio molle"
This is the oldest enameling technique: its name comes from French "cloison", meaning "cell", “compartment” or “alveolus”. After drawing the subject, wires are soldered on a metal sheet (gold, silver or copper) to draw the sketch, then enamels of different colours are spread in the cells formed thereby and the work is fired. Cloisonné allows the artist to melt different colours avoiding the typical expansion risks, which would produce cracks or detachments on the enamel. This way, "expansion bridges" form, so that the ancients were able to enamel without any chemical-physical knowledge whatsoever. An extraordinary example of this enameling technique is the so-called "Pala d'Oro" or Altarpiece of St. Mark's Basilica in Venice, created in Byzantine style. Main phases of Cloisonné enameling. Champlevé was born as an application of enamel in the engravings obtained by fusions of bronze. The Celts and the Barbarians from the North used this technique for the creation of jewels, sacred objects and objects for personal usage at least since the 4th century BC. The first historical testimony to this technique can be found in the writings of Philostratus of Lemnus (c. 290 BC). • Mechanical engraving with burin and chisel. • Chemical engraving by acid corrosion. Both techniques made it possible to produce much more precise and refined works with a higher expressive potential. Champlevé enamels became very common for the creation of religious works, such as the reliquary caskets, the chalices and the pyxides. Limoges can doubtless be considered the most important of the three aforementioned schools and the capital of medieval artistic enamel. Limoges (left) and Meuse (right) Schools compared. Notice the difference of style: a golden figure on enameled background and an enameled figure on golden background. “Basse-taille” enameling (or translucent enamel on bas-relief) has made its first appearance in the 13th century. The Chalice created for Pope Nicholas IV (1288-1292) by Sienese goldsmith Guccio di Mannaia is the first known example of this technique, preceding by some 30 years its diffusion in France. It is substantially an evolution of champlevé but, unlike the latter, is generally being used to decorate gold and silver. It consists of the creation of a chiseled bas-relief, and then the chisels are filled with transparent or translucent enamels which are applied and fired in more phases to produce shades and chiaroscuro effects in order to enhance the brightness of the precious metals. Translucent basse-taille is a full-scale covering technique and represents the first step towards émail-peint. Sometime later, the use of opaque enamel by the school of the so-called Pseudo-Monvaerni will be a further step forward. The most famous work of this kind is doubtless the Reliquary of the Corporal of Bolsena in the Cathedral of Orvieto, created by Italian goldsmith and sculptor Ugolino di Vieri. Two works (1945-1956) of a young Francesc Vilasís-Capalleja: on the left, a chiseled silver base, prepared for the creation of a basse-taille enameling; on the right, a finished example of translucent basse-taille on silver chisel. French expression meaning “painted enamel”: it consists of using enamel as if it were paint and the metal sheet as if it were a canvas. First of all, the metal sheet is covered of enamel on both surfaces and fired a first time: this way, the back of the sheet gets protected from the erosion of time, while the front is ready for the decoration. The latter is obtained by the juxtaposition or superimposition of many layers of coloured enamel which is applied as if it were paint. Every layer is bound by firing. Finely ground vitrificable colours are applied by brush to show up the details. This technique made its first appearance in France and in Italy at the same time. Jean Fouquet has made his famous self-portrait (now in the Louvre) after he returned from Italy, having learned émail-peint by Filarete. The best artists combine this technique with gold or silver sheets named paillons to light up the silk and cloth parts. The Grisaille technique or Cameo is similar to painted enamel. It is ideal to obtain a chiaroscuro effect. Its name comes from French word “gris” meaning “grey”, as it makes it possible to produce different shades of grey. Grisaille consists of the preparation of a black enameled background layer which is to be covered with uncooked white enamel. The latter must be scraped off with precision tools in order to produce layers of a different thickness and obtain a bas-relief effect. This way, the artist can get a wide range of grey shades thanks to the transparence of the scratched white enamel. The body parts are given a slight flesh-coloured tone, while the figures, the descriptions and the corrugated designs are applied in gold. The grisaille technique is typical of Limoges in the Renaissance period. The word Grisaille is also used for enamel on cathedral glass: in this case, dark black enamel with shades of brown, blue, green or grey is used. After the application, the enamel is partially or completely removed to get the required shades. For more information, see also “Enamel for glass”. On the left, Baptism of Jesus, 17th century, anonymous author. On the right, a modern work by Jean Zamora. Enameling technique consisting of the creation of transparent enamels held in an open framework made by wires or metal strips soldered to each other, so that ligh can get through. Unlike cloisonné, the framework isn’t attached to the support where enamel is applied: the latter, generally of metal or mica, which must be removed after the firing and cooling. This way, an effect similar to stained-glass window can be obtained. Invented in Italy and France during the 14th century, Japanese art has a parallel enameling style called Shotai Shippo, produced on a copper supporting surface which must be removed later. Plique-à-Jour portrayal of Jesus Christ by Orlando Sparaventi, Old Mill Museum, Himmerod. Literally "Painting on Enamel". This technique has been improved in Limoges during the 17th century. It consists of painting in a way similar to watercolor on ceramics. The artist begins by spreading a first background layer of opaque or lucid, white or pastel color enamel over a gold or copper plate (the latter is generally preferred). After the firing and polishing of the background, the painting first and the colored enamels later are spread by paintbrush. Each layer of color gets dried up and fired. Enamel en ronde bosse is a technique where the enamel is applied to rounded or tridimensional shapes in high relief. This difficult technique was mainly used for small golden sculptures and ornaments during the gothic and renaissance periods. The main problem with ronde-bosse is the necessity to preserve the naked metal from damage during the firing. For this reason, calcium sulphate is used to cover the areas of the object which don’t have to be enameled. The Salt Cellar of Italian artist Benvenuto Cellini is one of the most famous examples of "ronde-bosse"
The evolution of enameling represented by the invention of the “ronde bosse” technique played a decisive role in the development of more and more complex styles, so that it became possible to enamel even very irregular surfaces, such as high-reliefs and sculptures. The “ronde bosse” technique, in fact, makes it possible to enamel only little jewelry. The main difficulty to create works of larger dimensions consists, of course, of the risks of detachment, tensions or cracks of the enamel on the large and irregular surfaces of the sculpture, but the development of enamels with expansion coefficients calibrated to the metal surface has made it possible to overcome these problems. Also due to these risks, enameling on sculptures is rare even in our days. For the production of these works, the enameller may choose to combine two or more techniques, in order to obtain excellent results. Above: examples of enamel on copper sculpture. Below: two high-reliefs on copper enamel by Franco Bastianelli (Laurana). Miniature on Enamel is a technique of a quite recent origin, invented by Swiss artists Jean and Henri Toutin and brought to perfection by their disciple Jean Petitot in the 17th century. The new technique was inspired by medieval miniature and consisted of the creation of little portraits on copper with a method akin to Painting on Enamel. The artist applied pigments mixed with oil and turpentine over a white enamel base, finishing the work with a layer of transparent enamel, in order to give brightness to the piece. Nowadays artists rather prefer to use true coloured enamels to produce their paintings, in order to avoid the colours to change at high temperatures. The word Miniature has different meanings and was initially referred to the illustrations of the letters for chapters in medieval manuscripts, produced by the amanuenses. It is believed that the word comes from Latin word minium, the Medieval name for the lead oxide used to obtain the colour red. Since the 14th century, the word miniature came to be used for any kind of painting of little dimensions. Having always been confined to little dimensions, enamels are naturally predisposed to miniature, generally executed as painted enamel, painting on enamel or rarely grisaille. The designation Miniature on Enamel is restricted, on the contrary, to the more recent technique invented by Swiss artists Jean and Henri Toutin and perfected by their disciple Jean Petitot in the 17th century. Taking inspiration from medieval miniature, their technique consisted of little portrayed on white-enamelled copper with a method similar to Painting on Enamel. The artist applied pigments diluted with oil turpentine on a white enamel base as if they were watercolours, finishing the work with transparent enamel to give brightness to the work. Today, artists tend to use true colour enamels rather than pigments. Some artists prefer painted enamel rather than painting on enamel. Binoculars for theater with miniatures on white enamel. The technique of Miniature on Enamel rapidly spread in Russia, where it took the designation of finift (literally bright stone). Enamel in Russia was initially influenced by Byzantine art. It is just thanks to the will of the Orthodox archbishop of Rostov Veliky that by 1760 a first enamel atelier was founded and dedicated to the production of the earliest miniature icons with the technique of painting on enamel (For more info, see our Introduction to the World of Icons). In Rostov, finift was successfully applied to Russian sacred art, while miniature on enamel in the style of Toutin and Petitot began to be used throughout Russia for the production of secular precious objects such as snuffboxes, clocks, powder compacts etc. as used by the nobility and bourgeoisie in the 19th century. The favourite subjects of this style were the imitation of famous Western paintings (such as Rubens, Raphael etc.) and the production of portraits of the commissioners (mainly noblemen, tsars, bourgeoisie etc.). Finift Russian Icons, author and dates unknown. "Mina" is another enamelling technique which is often called "miniature". This style appeared in Iran at a much earlier date than its Western counterpart. It is believed by some experts that this technique appeared as early as the Sassanid era (224-651), although the most ancient traces of this enameling technique are dated to the first Islamic ruler of the Mongol Ilkhanate Ghazan Khan, who ruled over Persia between 1295 and 1304. The word “mina” is the feminine form of Persian word “minoo” meaning “heaven” and is referred to the use of Azure enamel as the main colour for this technique. In conformity with the precepts of Islam, “Mina” rejects the portrait of humans in favour of flower motives, animals and panoramas. Enamels of this kind are made with a technique not unlike to painting on enamel. The city of Isfahan (Persian: Esfāhān) is considered the most important centre for the production of “mina” enamels, which are used for a variety of applications, such as vases, dishes, jewels, candleholders etc. Examples of "Mina" enamels (Iranian miniature on white enamel). 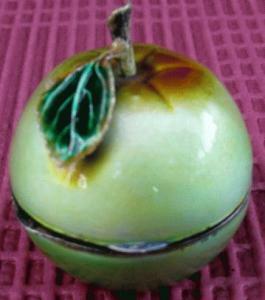 This is a decoration technique consisting of scratching unfired enamel with a sharp instrument, so that the underlying layers of enamel or the naked metal become visible after firing. The remaining figures are finished according to the artists’ tastes. In modern works, "Sgraffito" is used by artists as the enamel is still hot in order to obtain special effects. A similar technique called "Taglio Molle" (lit. "Soft Cut") was used by Italian enamellers Giuseppe Guidi and Giuseppe Maretto in the 20th century to mark the outlines of the figures, giving to the work a marked relief effect. Detail of Giuseppe Maretto's Saint Christopher. 45 x 110 cm, 1960s. Guilloché Enamel consists of the application of coloured translucent enamels on a repeated pattern obtained with the guilloché technology (i.e. metal worked with a manually-operated machine). Guilloché Enamel has been very appreciated by goldsmiths and silversmiths and was brought to its highest popularity at a world-wide level by the famous Fabergé laboratory, renown for the production of Easter Eggs and other jewellery works made of enamelled gold and silver for the Russian royal family in the 19th century. 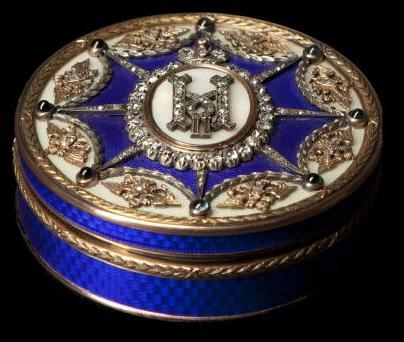 Blue-enamelled gold round box by Peter Carl Fabergé from the Foundation Sorgente Group. The repeated guilloché pattern is visible under the translucent blue enamel. The word "ceramic" describes a variety of inorganic clay-based materials which are easy to shape and which become hard after firing. There are many kinds of ceramic: maiolica, earthenware, porcelain, stoneware, pottery. The application of vitrified colors on ceramics is very different from enameling on metal and requires specific products to face the different expansions and temperatures of this material. Also, the adhesion of glazes on ceramics isn’t based on the same chemical and physical principles of enameling on metal. Nevertheless, the application techniques are very similar, including the use of kilns for high temperatures. Enameling on ceramics is easier and began to be used even before 3000 BC, as it can be seen in the pottery of the Samarran culture (Baghdad) about 5000 BC. The earliest enamels were surely obtained with sodium and potassium salts, which either emerged as the mixture was dried, or were added specifically. During the firing process, these salts melted into the mixture, forming a bright and resistant layer. About 2500 BC the Egyptians began to use the turquoise, which was derived from copper, and about 1500 BC the colors were improved, thus getting violet from manganese, yellow from chromium and lead antimony, red from iron and white from tin. Greek ceramics of good quality spread throughout the Mediterranean area, influencing its tastes. Etruscan “bucchero” with its typical dark color was produced in a reduction atmosphere about 1000 BC. The Romans learned and spread the best techniques throughout all Europe. Amongst the techniques exclusive to ceramic decoration, Raku is surely the most important. This is an original technique invented in the 16th century in Kyoto, Japan. Raku is rapidly spreading even in the West, thanks to the uniqueness and unrepeatability of the works and to the special iridescent effect of the colors. This technique consists of firing the piece in a hot kiln (900-1000°C); then, the work is cooled down rapidly in a container filled with organic fuel. The fuels burn as they touch the red hot work, so that oxygen is consumed (a process called ‘reduction’). The work is later dipped in water to end the cooling process and remove the remains of the combustible materials. This way the artist can obtain the characteristic iridescent effect typical of this technique. Some examples of enamel on ceramics: Etruscan Bucchero from the cemetery of Osteria dell'Osa and "Scudo" by Oronzo Mazzotta, Raku ceramics. Despite enamel is generally associated with metal and ceramics, it is also possible to produce and apply enamels on glass. Enameling on glass was born at the twilight of the Middle Ages, when ecclesiastical architecture begins to make use of large windows to light the interior. The first example of this technique is the abbey of Tegernsee in Bavaria which, accorrding to Philippe Burty, was rebuilt in the end of the 10th century. Enamels need to be fired at very precise and specific temperatures (520-800°C) and to be cooled very carefully in order to avoid cracks. Enamels for glass generally have a translucent effect in the artistic field, but cover coat enamels are largely used by craftsmen. Application of enamel on glass can be applied with the same techniques of enamel on metal; the beauty and brightness of this technique can still be admired in every church. The artist can apply enamel with the traditional painting techniques, especially by paintbrush but also by screen printing or decal. Transparent and translucent colors may be diluted and applied like paint in order to get shades and chiaroscuro. The transparence of glass allows painting either under or over glass. Cathedral glass, instead, is a technique that consists of fixing glass tesserae with lead solders until large dimensions are reached. The tesserae may be either transparent or translucent and colored. Enamel is applied over the tesserae and/or a layer of dark hard enamel is spread (also nicknamed “grisaille”) which gets later mechanically removed until the necessary shades are obtained. Naked woman, art by Sylvia Laks, enamel on glass. - Doro-Shippō (Opaque enamel): It consists of using opaque and dark enamels (in particular, green) at a low temperature (500-600°C). This is the earliest form of enamelling introduced in Japan and later replaced by the second half of the 19th century with brighter enamels and a wider colour palette, but it was recently reintroduced as part of traditional Nipponic art. - Hira-Shippō (levelled Champlevé): champlevé technique where the enamel was applied in the engravings and, once melted, it fills the engravings at the same level of the parts in relief, producing a homogeneous surface. - Hirata-Shippō (Hirata-Style Champlevé): technique consisting of the clutch of little enameled pieces on a non-enameled metal object. This style was developped by the Hirata Family. - Hōgyoku-Jippō (Cloisonné Jewel): works produced with modern cloisonné enamels but with the declared purpose to imitate the styles, colours and defects of Ming Dynasty enamels (1363-1644). The name was invented by enameller Kaji Satarō. - Moriage-Shippō (Cloisonné with bulges): the first cloisonné layer is covered with further enamel masses, producing reliefs of different colours and imitating a bas-relief. - Musen-Shippō (Wireless Cloisonné): cloisonné wires are removed before firing, thus obtaining a fully-covered enamel work without compartments. - Shōsen-Shippō (Cloisonné with hidden wires): cloisonné wires are covered with successive layers of opaque enamels and thus disappear under the enamel covering, giving an impression of wireless enamel. - Shōtai-Jippō (Plique-à-jour Japanese-style): enamel is applied like in wireless Cloisonné, but the metal base is later removed after firing by means of acids, thus leaving only transparent enamels linked to each other by a metal frame, with an effect akin to cathedral glass. - Takaniku (Thickness Champlevé): technique where the enamels overflow the reliefs and cover the entire surface. - Tōmei-Jippō (Basse-taille Japanese-style): transparent enamels are applied either with wires or wireless on a chiseled metal surface, whose decorative motives are partially visible under the vitreous enamel covering. - Tōtai-Jippō (Partial Plique-à-jour Japanese-style): little windows are cut in the metal surface and filled with transparent enamel, while the remaining frame is covered with opaque enamels, leaving an effect similar to cathedral glass in the windows and covering enamel on the frame. - Yūsen-Shippō (Standard Cloisonné): as with Western Cloisonné, it consists of using wires to separate the areas to enamel. - Yūmusen-Shippō (Cloisonné with and without wires): a cloisonné work which combines in the same work both Yūsen-Shipp¬ō and Musen-Shipp¬ō parts. - Zōgan-Shippō (Standard Champlevé): exactly the same as Western Champlevé, with enamels filling the engravings on a metal surface, while the reliefs are used as compartments and left enamel-less.